As part of the Lusciously Light challenges, Aussie asked us to choose whether we wanted to lighten up ourselves or our hair – I obviously chose hair, because my hair is a bit strange at the moment. The red is sloooooowly fading out and I tried to blonde it out (naughty) but all that seems to have done is lighten up my roots slightly, so its a blondey reddy mush at the moment. 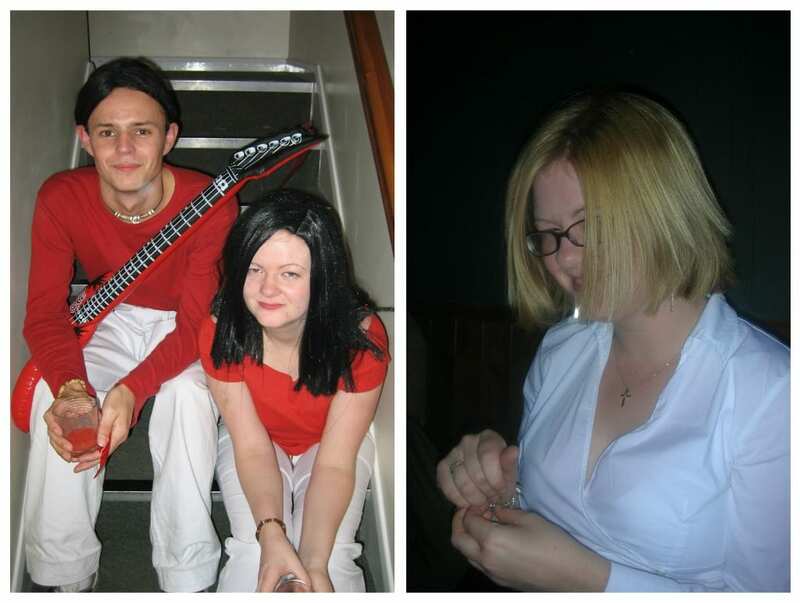 On the left is my friend Kev and I dressed as the White Stripes for Halloween in 2005 (we had an awesome party in my house that year before disappearing off to the Union for the traditional Rocky Horror night) – thankfully this was a very very cheap wig from Stars (the party shop in town – eeeeeeveryone knows Stars!). After I finished uni in 2006, I thought “Why not chop all off my lovely long hair?” It used to be past my elbows. Look at it. This was the only photo I could bare to share, because what I didn’t realise at the time is that I do not have the right shape face for a bob. A hair cut this short makes my face look CHUB. So it was a bit of a surprise to open the box and pull out a wig with less hair than the boyfriend has. I immediately had to try it on! Alex’s reaction was not the most positive – at least he wont be trying to dare me into this style! I reckon you could pull of a short style and you could go black, just not quite so short and boyish as this!!!! Take it from the queen of hair dye. DO NOT COLOUR YOUR HAIR. If you want to do something with your hair, go back to your natural colour, and get subtle high and low lights put in. You don’t suit harsh change. If you’d said ‘what hair should I have’ I would never have thought of this, but I really do think it suits you! Short hair is a scary step though!